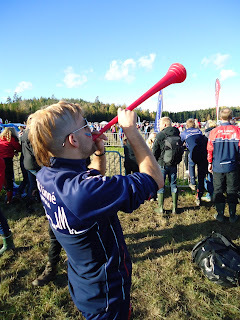 Sunday was the day of my best races at the North American Orienteering Championships, the sprint and the relay. Both races took place on a 1:4000, 2.5m contour map of the Pocono Environmental Education Center (and the surrounding forest). The Sprint- My best result of the weekend, a 3rd place finish. The sprint started off the same way as my other individual races, I messed up the first control. Despite a plan to take the first control slow, I had my map slightly disoriented when I hit the start triangle. The result was running along the road rather than across it and then a panicked scramble to re-orient; you can see this route below. My time loss was about 25s. Control 4 was a silly loss of 30s- I read the control code for 3 rather than 4 and ran off thinking I was at the wrong control. The number of leaves on the ground made noticing trails difficult, which lead to hesitations on the way to control 6 and a further loss of 15s. Controls 7 and 8 were where I stared to feel comfortable, they allowed me to pick up my speed and the fastest splits. I caught up to my teammate, Trevor at control 12 and ran with him for the remainder of the course. 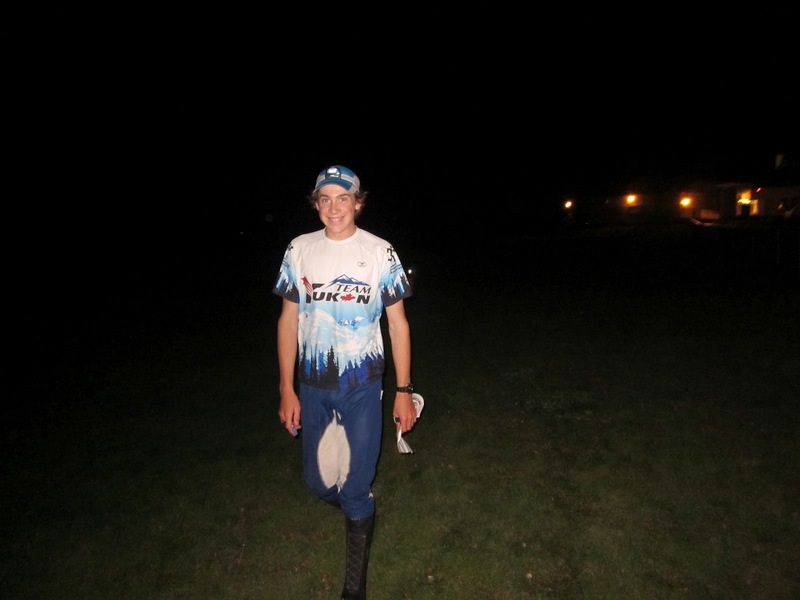 I ran the second leg of the relay on Can-1: Trevor Bray, Alexander Bergstrom and me. The NAOC relay was practice for JWOC, as Trevor, Alex and I will likely be running together this summer. Alex ran the opening leg of the relay. After a competitive run he passed off to me with Can-1 in a close third. 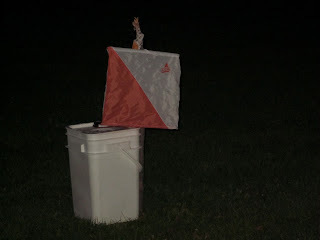 I finally manged to run a good first leg, taking a safe route along the flagged out of bounds areas. Over the next 15 minutes I demolished the course. My consistently good navigation allowed me to push physically and run faster than any of my previous races. In fact, I beat one of the top Americans, Ethan Childs, by over a minute (we had the same forking). However, as I came down the finish chute I passed a member of an Elite Woman's team. The volunteer at the map exchange was pointing at the Elite Woman's board (for the runner I passed) and I incorrectly assumed the volunteer was pointing at the Junior Men's board. I picked up the map form the correct position (but wrong board) and handed it off to Trevor. Trevor proceeded to run a great third leg and came in first, well ahead of the other teams. Unfortunately, my mistake at the map exchange resulted in Can-1 being disqualified. Only a heroic race by Can 2 (junior men) prevented a US victory in the Future Champions Cup. I take full responsibility for my mistake - it is my job to pickup and hand off the correct map. I am quite disappointed in myself for letting a lapse in concentration cost my relay team the victory and Canada the Future Champion's Cup. I apologize, but as I have heard from many people - things happen (especially in relays). Despite it's unfortunate end, I am very pleased with my race. It was the perfect race to end on - a reminder of how fast I can be and a lesson to learn from. I'm glad I made this mistake at the NAOC's rather than JWOC. It will serve as a memorable reminder to double check that the map I hand off is the right one. I greatly appreciate all the understanding and support I have received from the Canadian orienteering community. I look forward to representing Canada at future races. Canada Goes With Youth for NAOC Relay Teams! There may be some last minute changes to the team due to injuries. You can follow along online by tuning in to the live video feed and live results! A big thanks to Mike Waddington for handling the team selection! To give a bit of an update, I’m now starting my second year as a Masters student at Chalmers Institute of Technology in Gothenburg, Sweden. After WOC this summer my shape felt really good, my motivation was really high for the coming year, and I was able to put in a few really good weeks of training. The past month however has been a bit of a struggle, with injury and sickness, as well as settling back into school and living in a new part of town. One of the races I’ve most looked forward to this fall was 25manna, and after a bit of a break from racing, I was excited to get myself back into things. 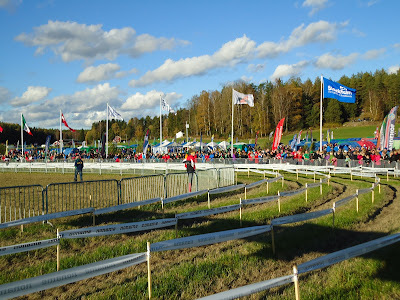 25manna (pronounced in Swedish as: shoo-fem-manna) was my first big race in Sweden last fall, and I really enjoyed it. It is an all-ages, whole-club relay, with 25 runners per team, where the winning club is deemed the ‘world’s best club’. 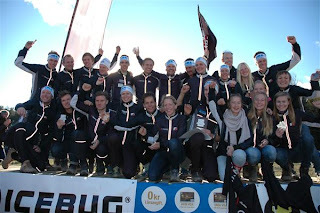 This past year my Swedish club, Göteborg-Majorna OK, has put in a lot of work into a “Gränslöst” project, to work on unity and development across all the age groups in the club. As one of Sweden’s biggest clubs, and after top 6 placings the past two years, the goal was to enter four teams, and to fight for the victory. The format for 25manna is a bit different. Legs 3 to 7 are run in parallel, with 4 runners on each leg. The first two, and the last three legs have only one runner per team. There are age and gender requirements for each leg, as well as a minimum number of women and juniors per team. It’s a bit hard to explain, and the leg requirements change each year, so here is a table of this year’s breakdown. I was selected to run the 5th leg on the really strong second team, as the second of four runners out. With 100 club members racing, as well as coaches and support crew, two buses were required to transport the club to the competition. 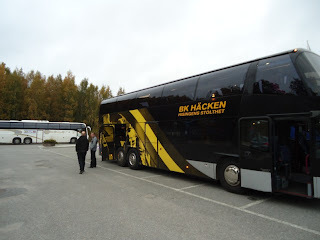 We all piled into the buses last Friday afternoon, and 6 hours later, after two bus quizzes, and a dinner stop at IKEA Linköping, we arrived at the hotel south of Stockholm. 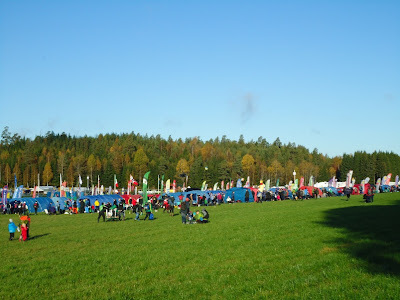 The size and club atmosphere of the event was apparent upon arrival to the parking area early Saturday morning. One of the cool things with 25manna, different from other individual races in Sweden, is that all the clubs travel in their own buses. The parking was located on an old runway, with a hundred buses lining the length of it. I took a video of the long walk down the runway, but didn’t get a chance to edit it. My team, GMOK 2, was off to a great start with some really strong early runs. The legs go by really quickly though, and before I knew it I was into the changeover area doing my final warm-up with my fellow leg runners; Viktor, Anders, and Magnus. The parallel legs are interesting in that you are always seeing doubles, those from the same club with the same tops, both warming up and in the woods. 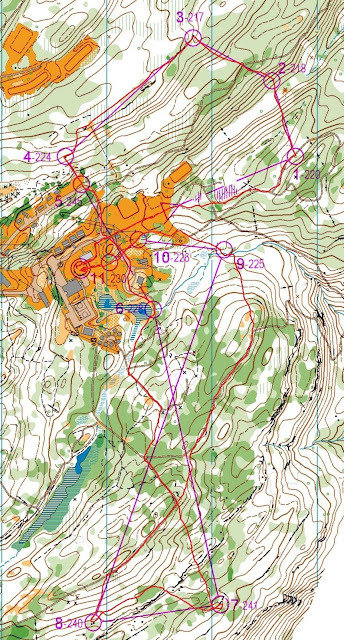 I was tagged off in really good position by Martin, the second youth runner on leg 4, 10s after Viktor. I ran an ok race with a few smaller mistakes. The pace was really high, and I was amongst other runners most of the time. I managed to “do my job” and exchange in as the first of my team, handing off to Ulf and the 40+ guys on leg 6. The other guys ran well, and we were able to move up 3 spots as a leg from 28th to 25th. It was a great day and a great weekend, and it was really cool to be a part of the GMOK crew. After three weeks of rain in Göteborg prior to the event, it was nice to have a weekend of sun, which definitely added to the positive feelings. A big thanks to the rest of the GMOK runners and to the coaches and for all their work! In recent years Magnus Johannson and Brent Langbakk have been volunteer coaches of Canada’s High Performance senior and junior team athletes. Due to education and family commitments, both have stepped away from their positions. The High Performance Committee (HPC) would like to thank Magnus and Brent for their hard work with the Canadian athletes, and wish them both well with their new life challenges! Full job descriptions are available on orienteering.ca. Please pass this information on to others you think may be interested in developing elite orienteering in Canada. 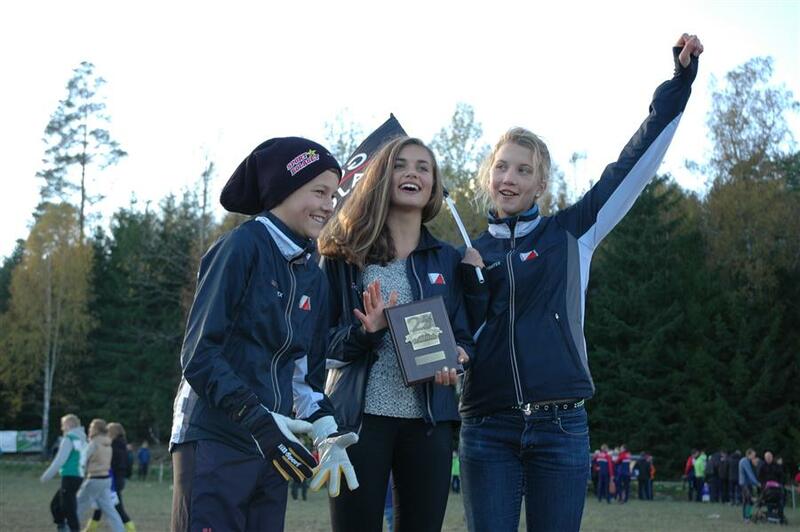 With the number of talented young athletes, and the work of the HPC over the past couple of years, it's an exciting time to be involved in elite orienteering development in Canada! With winter approaching faster than some of us would like, the Yukon Orienteering Association held their final meet; a night-O. With only five hours of darkness in the Yukon in mid-summer organizing a night-O can be rather difficult. So this years annual night-O was held in late September close to ten in the evening. The meet was held on the Hillcrest map where last years WCOC sprint was held. With my rather small headlamp I managed to find all the controls but not without a few bobbles. Fortunately the course planner hung some reflectors on the flags but those only help a certain amount when your headlamp only illuminates about six feet in front of you. Running through the woods was particularly difficult because your light would only illuminate the tree directly in front of you. Therefore in any dense woods you could only see about 2 feet forward. Another note, avoid running in any rough ground, it often leads to face-plants irregardless of the lighting outside. A big thanks to all the volunteers who made this year very successful and enjoyable! I have now been in Vietnam for about four weeks, and I'll be here for another two months. I am staying in a small community in the mountains of Hoa Binh province, called Dong Chua. The view from here is stunning and when I first saw the hills and mountains I could not wait to get out for a run. When I went for my first run, I ran up into the mountains, on a winding dirt road along the top of a ravine. I ran through another, even smaller community farther up in the mountains. I got a lot of strange looks from all the villagers, but I guess that's understandable. The road I ran along. Imagine. You live in a small community with less than 100 houses in the mountains of Vietnam. You have to boil all your water to drink. You have to boil water if you want to have a hot shower. You do your laundry by hand in a large metal bowl. You've probably never seen a person running just for the sake of it. You've never seen a person with blonde hair. You've never seen a Canadian. And suddenly there's this blonde haired girl, running through the one street in your community, wearing a very Canadian running top. Personally, I understand why they were surprised. This is the kind view I had on my run. Unfortunately, when I was returning from my run, the Vietnamese supervisor of the group I'm with saw me and questioned what I had been doing. When he realized that I had been out running in the mountains on my own (with a cell phone and on a road that never split so I couldn't possibly get lost), he told me that I can't do that again because it's dangerous. Looks like I'm not going to be orienteering any time soon. Another view from my run. I have, however, convinced a few other members of the group to come running with me occasionally, so at least that won't be given up completely for the next two months. 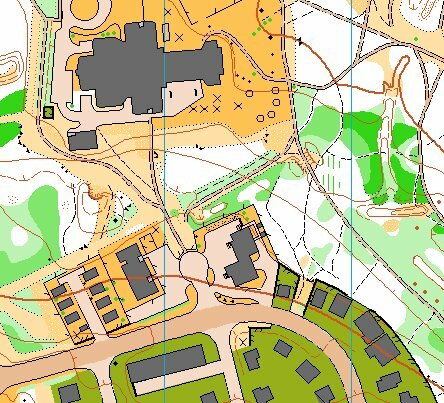 I also spent some time talking to other members of the group about orienteering and there are a few of them that seem quite interested in trying it out. I'm hoping that once we get to Port Alberni, BC, for the second part of the trip that we will have access to some maps and I can spend a day teaching orienteering to the nine other Canadians and the ten Vietnamese. I am going to miss orienteering very much over the next couple of months, but I know that even just the occasional run or hike in the mountains will absolutely phenomenal! The view from the Cultural House in the village. Don't you just want to running in those mountains? It's quite typical to see water buffalo being herded down the street. Orienteering is a wonderful sport! 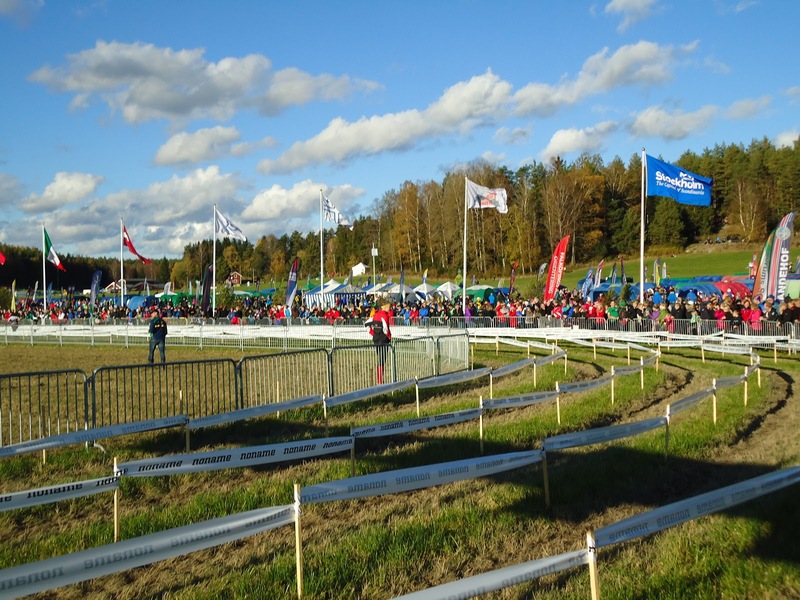 Canada Cup Update ~ Lots to report with 5 races to go! With 5 races to go, it's still anyone's guess as to who will win the Canada Cup Elite Series.... here are the latest standings after the 3 Canada Cup races held in conjunction with the BC Orienteering Championships. In the men's category, Adam Woods won his first Canada Cup race in the middle distance on Whistler Mountain. Adam ran a confident race, commenting afterwards that his race was "excellent", and he enjoyed the challenge of the open, rocky terrain. In terms of standings, Graeme Rennie and Brian May both ran excellent races to close the gap to leader Will Critchley and second place Eric Kemp, but Will and Eric are still far enough ahead it's unlikely either Graeme or Brian can take over the lead in these last few events. Since this was the BC Champs, the Greater Vancouver Orienteering Club (GVOC) amassed a good amount of points to have a comfortable cushion over Ottawa Orienteering Club (OOC). However, with all 3 sprint, middle, and long distance races at the Ontario Champs next weekend being designated Canada Cup races, OOC does have the opportunity to make up the difference. Can GVOC hang on to the "Best Club in Canada" crown for a second year?? It's still anyone's Cup to win... stay tuned!